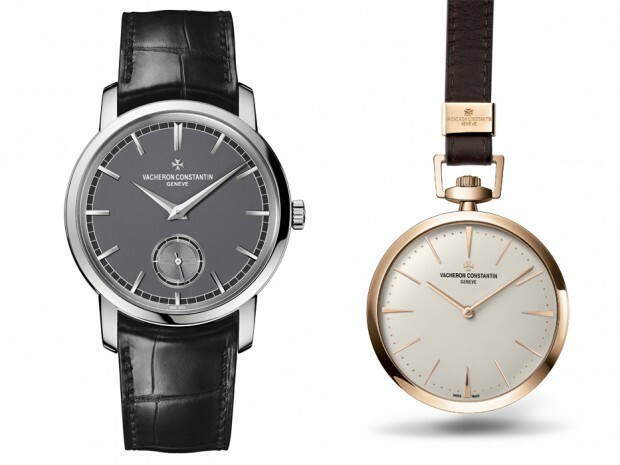 The Swiss manufacturer Vacheron Constantin has been around since 1755 and is one of the oldest watch manufactures in the world. The company recently unveiled two new timepieces: the Patrimony Traditionnelle small seconds watch and the Patrimony Contemporaine pocket watch. The Patrimony Traditionnelle small seconds watch is a tribute to the manufacture’s creations during the period of the 1930 to 1950s. The watch comes in a case that is 38 millimeters in diameter and 950 platinum. A lender bezel is part of the sleek design of this case. The caseback features sapphire crystal and is a fluted screw-down. Inside this case is the Vacheron Constantin 4400 movement that meets the requirements of the Poincon de Geneve (Hallmark of Geneva). The flat surfaces of the movement are adorned with “Cotes de Geneve” motif. The calibre beats at a rate of 28,800 vibrations per hour (4 Hz). The movement has a power reserve of 65 hours. The dial is slate-grey and features the time with long 18-carat white gold applied hour-markers. The dauphine hour and minute hands stand out nicely against the dark background of the dial. Finishing off the look of the watch is a black alligator leather strap with a 950 platinum pin buckle. The second timepiece, the Patrimony Contemporaine Pocket Watch, is a watch designed to commemorate the first pocket watch made in 1755 by Jean-Marc Vacheron. It comes in a 43 millimeters diameter case and also meets the requirements for the Poincon de Geneve. The case is slender and is made of 18-carat 5N pink gold. Inside the case is the mechanical hand-wound Vacheron Constantin Calibre 4400 that can be seen through the transparent sapphire crystal caseback. The dial is a beautiful pure paline silver-tone that features pink gold baton-shaped hands applied hour-markers. The 30 cm brown calf leather cord and 18-carat 5N pink gold chain nicely compliment the look of this pocket watch.